Cleveland Browns defensive lineman Danny Shelton has been named the 2018 Petplan Pet Parent of the Year (photo credit: Greg Murray). "To be named the Pet Parent of the Year at this year’s Vet Awards is really special, and I’m excited to take part in the event,”says Shelton. 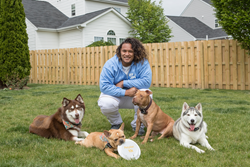 Petplan pet insurance has named pro football star Danny Shelton as their “Pet Parent of the Year” for the 2018 Veterinary Excellence Awards. Shelton, who has four rescued dogs, distinguished himself among this year’s candidates through his public advocacy of pet health, hands-on work in the community and commitment to providing relief aid to pets affected by Hurricanes Harvey and Irma. Shelton’s awareness-raising work addressing pet health issues like adoption, responsible pet parenting, the dangers of secondhand smoke and the importance of pet insurance makes an impact on pets’ lives every day. At Christmastime, the defensive lineman plays Santa Paws at Cleveland-area shelters, distributing much-needed food and supplies — many of which he donates himself. And when hurricanes devastated communities in the Gulf Coast last summer, the 2015 first-round pick out of the University of Washington partnered with Petplan to make a $55,000 donation to pet organizations for hurricane relief. “Danny’s a big guy with an even bigger heart, and we can’t wait to recognize his efforts at the 2018 Veterinary Excellence Awards,” added Ashton. Shelton is honored to be recognized at the event. Shelton will receive his award at the Petplan Veterinary Excellence Awards on February 2 at the Four Seasons Resort Orlando. The ceremony is a black-tie gala and dinner that celebrates the achievements of outstanding veterinary professionals and one exemplary pet parent. For more information about Petplan’s annual Veterinary Excellence Awards, visit Petplan.com/vet-awards.